Not much more will go further to building the yard of your dreams than a good weed killer. 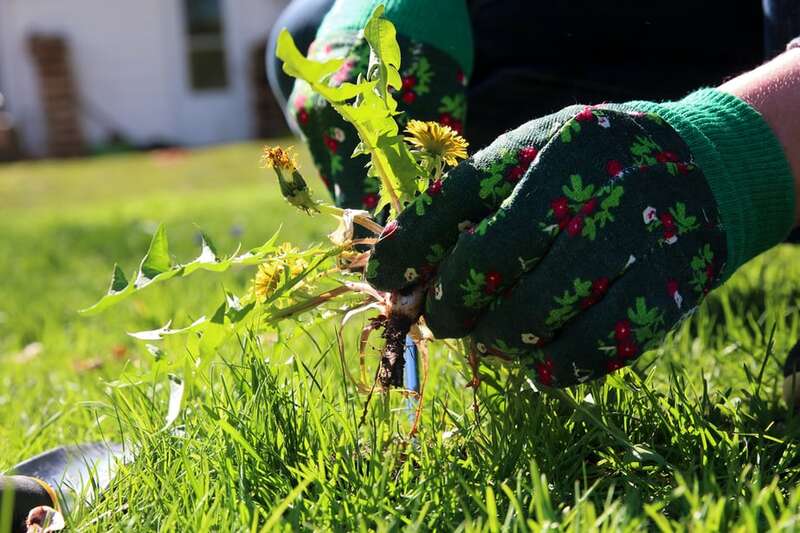 Infectious growth of weeds can destroy the beauty of a yard by wedging themselves underneath garden fences and around landscape borders… in short, weeds are a pain to get rid of. To fix that, we’ve assembled a list of the best weed killers for lawns. Since many weed killers come with different features (how long it takes to kill weeds, how long weeds are killed for, price point, etc. ), we’ve made sure to break each option down so you can decide which one is the best for you. Let’s get started with our best overall. Immediate Results: Visible results in 12 hours! This is the fastest working product Roundup offers! Concentrated Power: DO more with less with the concentrate plus. Dilutes to cover the biggest jobs. Roundup’s weed killing solution is famous. This is the name brand of all weed killers for one good reason: it works. The Roundup weed killer does well on a lot of fronts. For starters, it is pretty fast acting. Roundup’s patented FastAct technology makes it so that you should see some results within about 12 hours. It can take up to a week for a weed to die off and turn brown, but there should be some color change in the weed within the first 12 hours. Another perk of the Roundup is that it is rainproof within 30 minutes. It is recommended to spray your weeds on a warm, sunny day when there isn’t any rain in the forecast for about 24 hours. Although, there are unexpected circumstances when you catch a storm that came out of nowhere. For those times, it doesn’t hurt to have a weed killer for your lawn that is rainproof. One potential downside to this product is that even though it is marketed as Concentrate Plus, it isn’t too concentrated. You’ll need about 6 ounces of concentrate per 1 gallon of water when you’re mixing this solution. For its concentration, the Roundup sells at a reasonable price. Roundup weed killer is well-known and millions have used it to make their yards look just how they like. This is a good overall solution. It doesn’t excel at too much, but doesn’t have many downsides and is a great purchase if your situation isn’t too wild or if you’re just looking for a trusted brand you know will work. 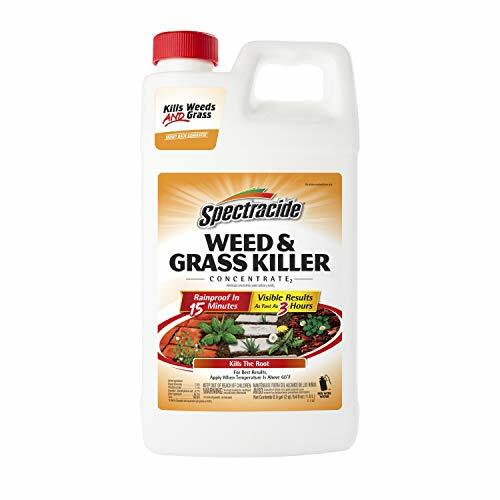 Spectracide’s weed killer for your lawn is our top pick if you’re the kind who likes to see visible results fast. This weed killer moves fast. Once sprayed, your plants should take about 3 hours to start showing signs of their impending doom: the leaves will begin withering, shriveling, and turning yellow in the time it takes you to watch a good football game. Most weeds should be dead within about a week, but this can depend on your spraying conditions and weed type. Spectracide is quick in more ways than one. The formula that Spectracide uses becomes rainproof in 15 minutes. This isn’t a make or break feature, but it’s nice to know that you can spray right before a rain shower if you have to. Some buyers have mentioned that even though this formula acts fast, it doesn’t always do a great job at killing to the root of the plant. For that reason, it may be best used as a weed killer for your “runner” roots that some plants send out above or near the top of the topsoil. This weed killer is pretty concentrated. The recommended dosage is 3 ounces of concentrate per 1 gallon of water. The Spectracide is unique among weed killers in that it comes with a guarantee. There isn’t a lot of information on Amazon or the manufacturer’s website, but the manufacturer does say that you can get your money back if you aren’t seeing results. The Spectracide weed killer for your lawn is a good option if you love to see results fast. This weed killer should start showing its effect within 30 minutes. The RM43 is our top pick if you’re looking to spray and forget. The RM43 is the option you’re looking for if you’ve ever considered salting your yard to prevent anything from growing. The results aren’t immediate, but this solution will devastate anything it touches in your yard for about a year. During that time, the RM43 prevents growth from just about everything in the areas where you spray it. If you do end up spraying with the RM43, it will take about a week before you see any results. No fast-acting solutions here and no brown, withered leaves within 3 hours. This solution takes a little time, but it does a great job of killing to the root and preventing future growth. This solution isn’t too concentrated, so you’ll go through it fast if you have a wide area that needs taking care of. You’ll need about 6 ounces of concentrate per gallon of water. That amount is higher than some, but remember that you won’t have to reapply this solution for about a year, so you may end up saving a few bucks even with a lower concentration. We do recommend caution with this one. It’s best to apply to areas where you want nothing to grow. This weed killer will also kill grass or plants, so caution wins the day with the RM43. If you’ve ever asked what weeds would do if a nuclear reactor were to poison the earth, this weed killer is a pretty close second. 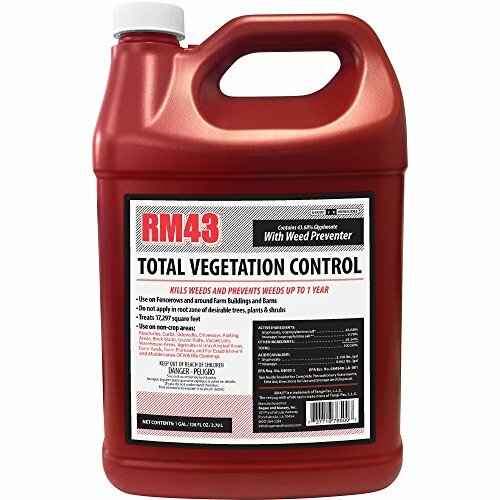 The RM43 is a great option if you want to prevent weed growth for the long term so you don’t have to keep applying your weed killer. Safe for pets, horses, chickens, people and the environment. Ready for replanting when dry. Will not stain hardscapes. We’ve never met him, but we know that Rudy Kirchner must be a pretty nice guy. He made an all-natural weed killer that gets rid of your unwanted invaders that is safe for all our furry friends. 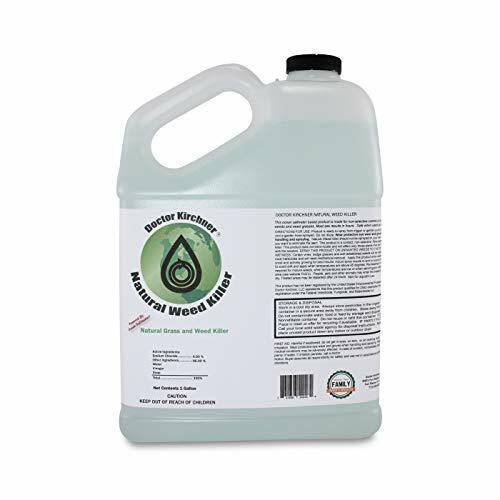 This weed killer is unique in the market for the fact that it is both natural and simple: the ingredients are saltwater, dish soap, and concentrated vinegar. Simplicity does not equal ineffectiveness though; this weed killer will hang with the best of them. Doctor Kirchner’s weed killer is one that will act pretty quick: you can expect the initial signs of decay within a few hours. The formula is rainproof once it is dry and unlike other competitors, you can plant where you just sprayed as soon as the area is dry. One perk about this solution is that it is a perfect fit for anyone who has animals. The solution won’t harm furry friends or livestock, so it’s safe to use wherever you like without fear of keeping your animals away from the area for a few days. The Doc Kirchner weed killer doesn’t require any mixing, which is both a feature and a bug. The bug is that you can’t make this mixture go any further, so you’ll need to buy more of it compared to other solutions. The feature is that you can’t make it too potent or not potent enough. Doctor Kirchner’s weed killer is a great pick and our recommendation if your primary concern is animal (or your own) health. These ingredients won’t harm you, your dog, your cat, or your livestock, so this is a good pick for animal owners. Compare-N-Save’s weed killer solution can help you be sure that you aren’t overpaying. This formula doesn’t excel at any one thing, but it does a lot of things well at a budget-loving price. The Compare-N-Save weed killer is one of the slower of our options we’ve reviewed today, but not the slowest; you should be having visible results of your spraying within 2 to 4 days. The formula is rainproof within a couple of hours, but we will discuss later why it is always recommended with almost all weed killers to spray on a day when no rain is predicted for about 24 hours. We go over this in the Frequently Asked Questions section. It is best to keep animals out of sprayed areas until the area is dried, so this solution isn’t quite animal-friendly. It isn’t grass-friendly either, as it will kill just about everything that you spray it on. This solution is pretty concentrated. You will need 2.5 ounces per gallon of water to kill your weeds. This solution doesn’t take care of future growth, so you can plant within a day or so of spraying if you’d like. Compare-N-Save concentrate does kill to the root. 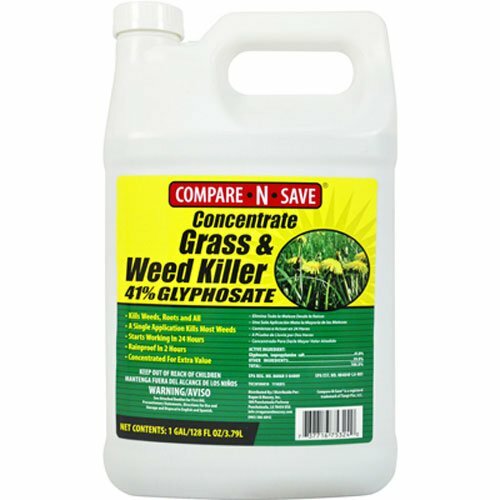 The Compare-N-Save solution is a good option if you’re looking to get a lot of what other weed killer solutions offer without paying so much. We recommend this brand if you don’t have any special requirements (don’t need to see results in 2 hours, don’t need to prevent future growth, don’t need to protect animals) and don’t mind buying a more generic brand as opposed to name brand. And sure, it’s a lot of fun to spray the weeds, blink, and already see them turning some shade of brown. But is it most effective? As the saying goes, sometimes good things come to those who wait. While speed can be fun and it’s nice to see quick results, sometimes speed hampers future objectives. If you noticed on our list above, the fastest solutions are the ones that may have the most trouble killing to the roots. It’s not a bad idea to take a look at how fast the solution acts after spraying – that’s a feature and it is worth knowing. Speed is not the end-all-be-all, though. If you know that you’re going to have your annual Best Looking Lawn Competition in a couple of weeks and you’re running behind on your spraying, by all means, go for the fast-acting weed killer. However, if you want to kill the roots and prevent future growth until next year, it may be best to move on. One of the most often overlooked and underappreciated features of weed killers for lawns has to do with the concentration of the weed killer solution. Concentration isn’t everything, but it does go a long way to making sure that you get the results you’re wanting out of your weed killer. So there are several benefits to buying higher concentration, but if you’re looking to save a few bucks in the short term, higher concentrations may not be the best option for you. In general, the initial expense of buying a higher concentration tends to be a little higher than the initial expense of buying a lower concentration. Buying a higher concentration will save you money in the long run, but can be more expensive in the here and now. It’s worth looking at the concentration of your preferred brand and knowing how much you’ll need to mix with water (the directions should be on the bottle and we discuss this for the options on our list in the next section). How much is the right amount of concentrate to mix with water? When mixing your solutions, many battle-tested gardeners will double the concentration per gallon of water if they’re wanting to kill bushy plants, perennials, or other tough-to-kill weeds. What are the ideal spraying conditions? All weed killers for lawns should be sprayed on days that are at least 60 degrees Fahrenheit or 16 degrees Celsius. Ideal spraying conditions are on a sunny day with no rain forecast for about 24 hours. If there is a chance of rain for a while, you may want to go for a fast-acting weed killer or wait until the rain has passed. This is important because rain can harm your weed killer in a few ways. First, it can transport the weed killer to unintended targets like your grass, crops, or other plants that you want to keep alive. Second, rain can also dilute your weed killer to levels where it won’t have any effect at all, meaning that you wasted all that time (and weed killer) for nothing. For those reasons, you will end up saving more time and money just waiting for the rain to pass. It is worth mentioning that you might want to be careful spraying on windy days too. The wind can cause a bit of drift between your intended target and where the solution ends up, so you may end up spraying plants that you want to keep by accident. You can read more about the ideal spraying conditions here. Can I plant flowers or other plants after spraying? This depends on the weed killer formula that you’re using, but a good general answer is that you should wait a few days after spraying to begin planting. There are exceptions to this rule: Doctor Kirchner’s natural weed killer allows you to plant as soon as the solution has dried, which shouldn’t take more than a few hours at most. Planting can be done soon after because Doctor Kirchner’s formula is natural, so it breaks down in the soil faster than other formulas. Some weed killers will say that you can begin to plant soon after. In these situations, it still may be wise to wait for a little after the recommended time frame. Planting a day too late won’t harm you too bad, but planting a day too soon may cost you some of your flora. 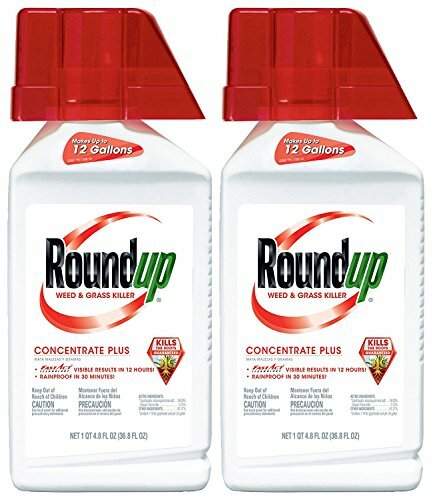 Roundup is a company operating under Scott’s Miracle Grow. This company was started all the way back in 1868 when Civil War veteran Orland McLean Scott opened a hardware store in his home town of Marysville, Ohio. Scott believed that farmers should have clean, weed-free fields and grew his company to reflect that value. Since 1868, they’ve expanded and are still working to conquer weeds everywhere. Spectracide is made by Spectrum Brands, a worldwide leader in home and lawn care products. Spectrum and Spectracide want to make it easy for you to own your yard, so they go out of their way to provide solutions that can fit your lifestyle. RM43 is a product offered by Ragan & Massey. They’ve been in business since 1991 and are searching for new ways to serve the hardworking people who use their products. They want to be the company that provides the right solution on time, every time so that you can walk away with a smile and the yard that you deserve. Rudy Kirchner started his natural weed killing solution when he noticed that he was getting sicker and sicker from using the big name brands on his yard. He noticed that when he stopped spraying, he got better, so he began to make his own natural weed killer that was good for the yard, good for the furry friends, and good for people. Thanks for reading our guide on the best weed killer for lawns! When it comes down to it, the best option for you is going to be the one that suits your unique needs best. You’ll first want to consider what you want to accomplish with your weed killer. Are you looking for quick, more shallow results or are you looking to devastate any weeds in the area for a long time? Next, you’ll want to consider the concentration of the weed killer you’re looking at buying. High concentration can save you time, energy, and money over the long run, but higher concentrations, in general, tend to cost a fuzz more. For saving a few bucks today, you may want to go with the lower concentrations. Lastly, you’ll want to look at your budget for your weed killer. Price doesn’t always equal value, but some of the pricier options may last you for a longer period of time, helping you save a few dollars in the long run. Our overall top pick is the Roundup, but when all is said and done, the best weed killer for your lawn will be the one that can fit your unique situation. There are some good options here for everyone, so don’t be afraid to be a little picky and take your time looking around at which one is best for you.